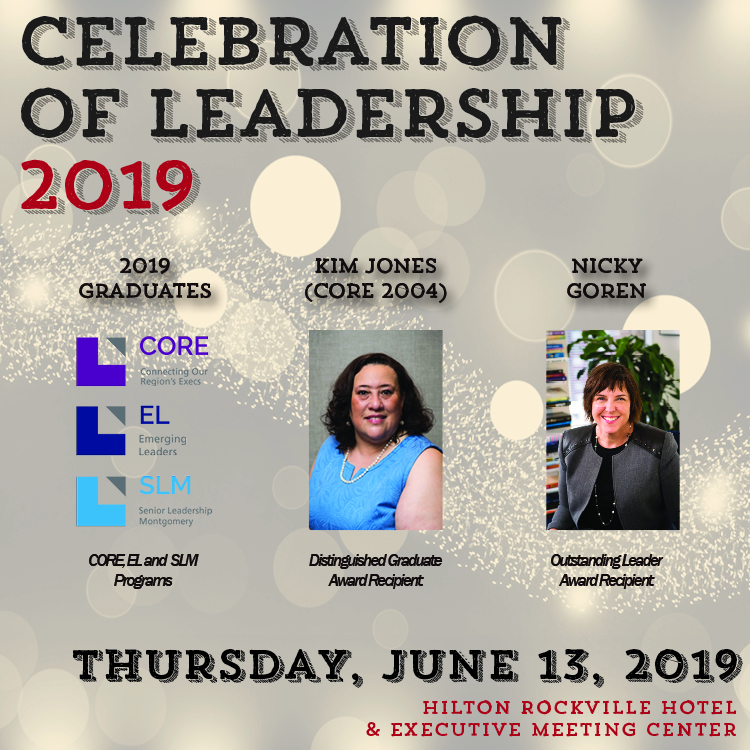 Rockville, MD– On June 13, 2019, Leadership Montgomery will present their Outstanding Leader and Distinguished Graduate Awards to Nicky Goren and Kim Jones (CORE 2004), respectively. The Outstanding Leader Award recognizes and rewards an individual whose contributions through exceptional leadership have made a difference in Montgomery County. The Distinguished Graduate Award recognizes a graduate of the program whose continued leadership activities embodies the highest standards of Leadership Montgomery. Goren, President & CEO of the Eugene and Agnes E. Meyer Foundation, has made a career of changing lives and advancing our community. Helping to fund several local nonprofit organizations, Goren is a champion for service and volunteerism. She also serves on several nonprofit boards and was appointed to the DC Rising Leadership Committee by Mayor Muriel Bowser. Jones, Executive Director of The Nonprofit Village, has had impressive success as a respected leader in the nonprofit community. A 2004 Leadership Montgomery CORE program graduate, Jones has more than 20 years of experience helping both local and national nonprofits thrive through program development, cross-cultural communications and strategic alliances. In addition to the awards, Celebration of Leadership marks the completion of the CORE (Connecting our Region’s Execs), Emerging Leaders and Senior Leadership Montgomery programs. The event will highlight 129 graduates from all 3 programs. Leadership Montgomery’s Celebration of Leadership will be held Thursday, June 13, 2019 at The Hilton Rockville/Washington DC Hotel and Executive Meeting Center. The graduation and program will begin at 6:00 PM. The party and reception will immediately follow. Early bird tickets are available; $135 for LM Members, $165 for nonmembers and $100 for attendees under 35 and over 65; through April 30th. Tickets can be purchased at www.leadershipmontgomerymd.org/celebration-of-leadership.